I begin by forming a cone. 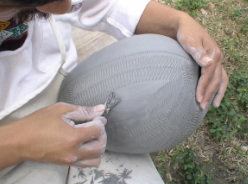 Then, using my fist, I punch the clay to form a thick bowl shape. The thick bowl must sit overnight. I begin to thin the bottom half using a paddle and stone. I use my feet to hold the pot, the stone is placed inside as I paddle the outside. When the bottom is ready, the pot must rest until the next day. On Day three I begin raising the sides. 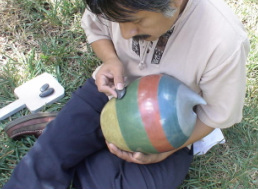 I continue to thin and raise the sides using the stone and paddle. My goal is to achieve uniform thickness. vessel must sit until the next day. I use engobes or earth paints. I gather the pigments myself and mix my own engobes. resist. I gather this myself as well. I use a smooth stone to burnish my pieces. This is an all day process. The results will be a glossy glass-like finish.